There are not many names more noted in the history of the human intellect than that of Pythagoras of Samos, whose epoch, although uncertain both as to its beginning and as to its termination - for neither the year of his birth nor that of his death has been definitely ascertained - may be fairly presumed to have extended from about the year B.C. 567 to about the year B.C. 497. He belonged, therefore, to the generation immediately following that of Solon and immediately preceding that which fought the Battles of Marathon and Salamis. 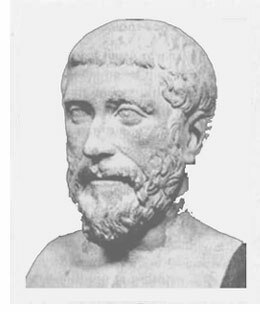 He was a native of the Island of Samos, in the Aegean Sea; but he spent very little of his life in his native land, which, during considerable part of his time, was under the government of Polycrates, who, although a tyrant, in the Greek sense of that word, was the personal friend of the philosopher. He traveled extensively in Greece and Egypt, and it is believed also in various countries of Asia, possibly including Persia and Hindustan. By Polycrates he was commended to Amasis, King of Egypt, which country he was most eager to visit in order to acquire for himself, if possible, the wisdom and the learning of its mysterious priesthood. Pythagoras, it is stated, remained in Egypt for 22 years. He visited the cities of Heliopolis, Memphis, and Thebes. In the latter he seems to have succeeded in ingratiating himself with the all-powerful priesthood, and to have been, in part at least, initiated into their mysteries. He is supposed to have been in Egypt at the time of its conquest and devastation by the Persian conquerer Cambyses (B.C. 526), and afterwards to have been taken or to have gone in his train to Asia. He is presumed to have found his way to Babylon, and there to have associated with the ancient sages of Chaldea, and with such of the priests and elders of Israel as yet remained in the great city on the Euphrates. Further surmise takes him still farther into Asia, to the banks of the Indus and the Ganges, and to association with the Brahmins of Hindustan, with whose doctrines and practices he certainly showed some acquaintance. But the supposed travels of Pythagoras are all mere matter of conjecture; he was himself in after life very reticent in regard to them. Returning home from his travels, Pythagoras sojourned for a time in 'his native island of Samos, yet under the government of Polycrates ; but he did not tarry long there. He desired a more congenial soil for a trial of his economic and philosophical theories. Restless and ardent spirits among the Hellenes then looked to the west, somewhat as we do today, as an appropriate place for the establishment of new standards of life and new theories of government; and their Hesperia, or Land of the West, was Italy and Sicily. Sicily and Magna Graecia had already received numerous Greek colonies, and Greek adventurers were constantly flocking to their shores. Pythagoras looked on Magna Graecia as his Land of Promise. Passing through Crete and the Peloponnesus, in the latter of which he assisted at the Olympian Games, he finally found his way to the City of Crotona, on the Gulf of Tarentum, where he was so well received that he resolved to make the place his permanent habitation. There he established his school of philosophy, gathered scholars and adherents around him, was entrusted by the citizens with the work of remodeling their institutions, established a philosophical republic on combined aristocratic and socialistic lines, and died there at an advanced age about the year B.C. 491. But the institutions which he established did not long survive him; they were impracticable. Many of his theories, however, had a wonderful fascination for after ages; and this fascination, together with his many virtues, long kept the name of Pythagoras alive in the cities of Greece and Italy, and has commended him even to the modern world as one of the greatest philosophers of antiquity. Pythagoras was a great astronomer and mathematician as well as philosopher. He it was who gave to the world the demonstration of the proposition which stands as the Forty-Seventh Theorem in the first book of Euclid's Elements of Geometry, that the square of the hypothenuse of a right-angled triangle is equal to the sum of the squares of the other two sides of the triangle, a proposition without which there could scarcely have been a science of mathematics, or of geometry, or of astronomy. He proclaimed that the sun, and not the earth, was the centre of what we now call the Solar System, therein anticipating by about two thousand years the great discovery of Copernicus, although his theory, which was probably derived from the astronomers of Babylon or Hindustan, obtained no credence at the time or afterwards in the western World, and gave way to what is known as the Ptolemaic System of Astronomy. Of the philosophy and philosophico-religious theories of Pythagoras we have no more than fragmentary knowledge. For if he wrote anything himself, his writings have not come down to us; and his disciples, imbued with his own mystical views, do not seem to have been eager to communicate them to the world. The cardinal principle of his philosophy was the supposed unity of mind and matter, the gradual elimination of matter as the grosser part, and the final absorption of the soul or spirit into the universal spirit. This theory leads to arrant pantheism. It is the theory of Buddhism and the Buddhistic Nirvana, as well as that of the Vedanta school of philosophy among the Brahmins, with this he combined the theory of metempsychosis, or the transmigration of souls from one body into another in the course either of purification for the ultimate absorption into divinity, or of ultimate perdition and destruction. In supposed furtherance of this theory he asserted that he distinctly remembered that his own soul had previously been impersonated in different other individuals whom he named, and of whom one was Euphorbus, a Trojan, who perished during the siege of Troy. It was these doctrines of his, savoring so much of Orientalism, and especially of the wild speculations of Aindustan, that superinduced the belief that Pythagoras had learned his theories by personal contact with the Hindu priesthood.